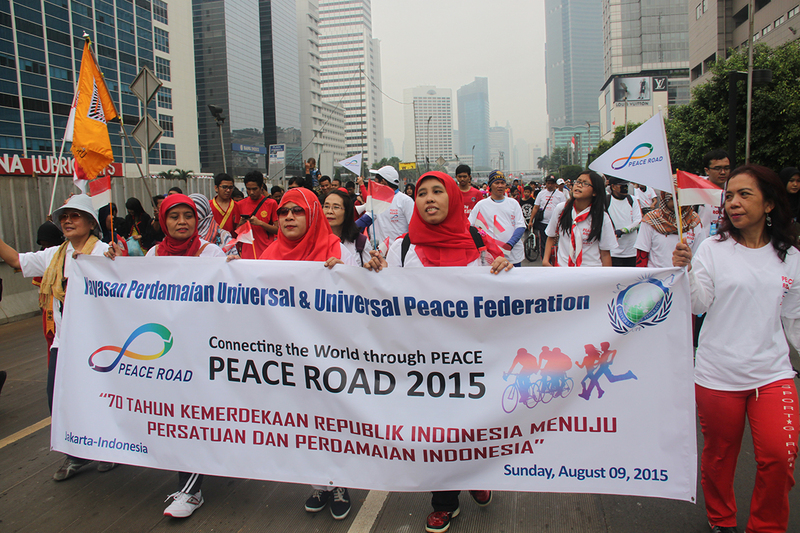 UPF Indonesia, August 9, 2015: For the Indonesian Peace Road 2015, we chose to walk from the Governor’s Office along Jalan M.H. Thamrin until the Hotel Indonesia Roundabout and return back to our starting point at the Governor’s Office. Every Sunday morning, this route is frequented by pedestrians and cyclists as it is a car-free day and Jakartans enjoy walking peacefully in the early morning hours without being disturbed by any traffic. However, August 9, was special, just a week ahead of the grand celebration of the 70th Anniversary of Indonesia’s Declaration of Independence, Central Jakarta was decorated in red and white, the colors of the Indonesian flag symbolizing ‘sacrifice’ and ‘purity’. 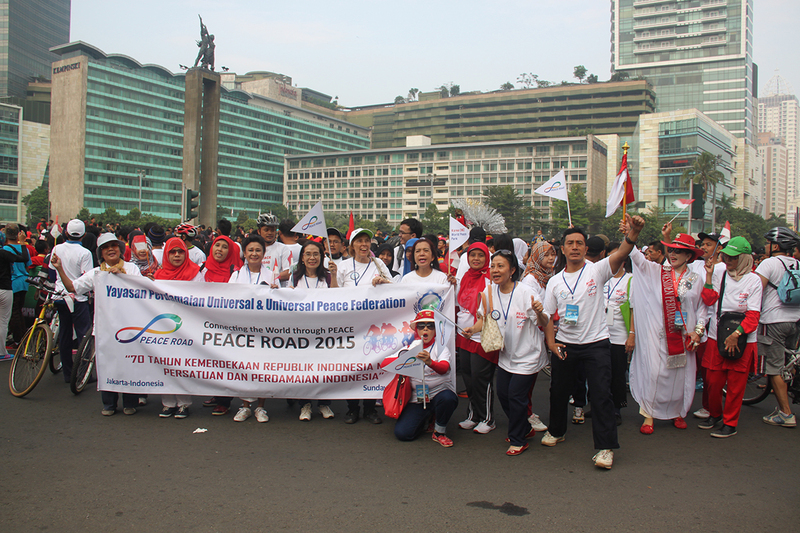 To express their patriotic love and devotion to their country, many of the Indonesian Peace Road participants chose to dress in red and white, too, visually underlining the theme of our march: 70 years of Independence of the Republic of Indonesia: Towards Unity and Peace in Indonesia. Registrations started early in the morning, even before sunrise. 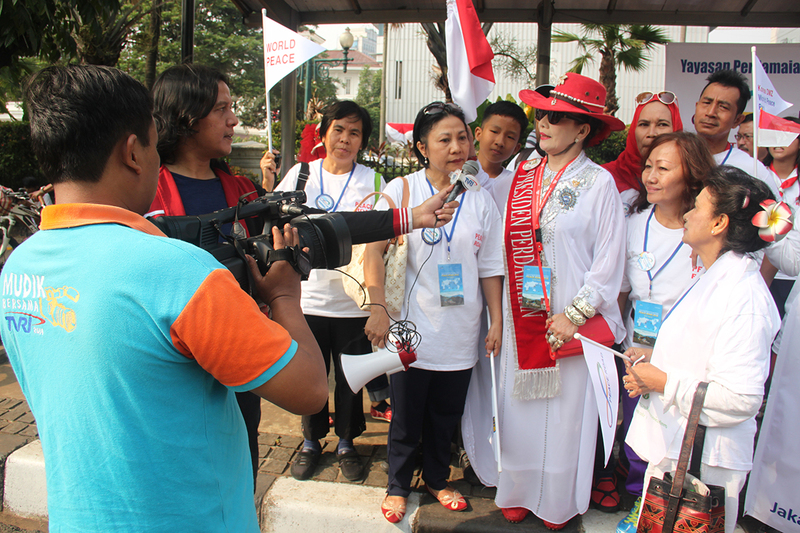 After singing the National Anthem, signing the Peace Road banner and brief explanation of the significance of this program, Mrs. Herawaty Rinto Paeran, Indonesian Peace President, flagged of the march. 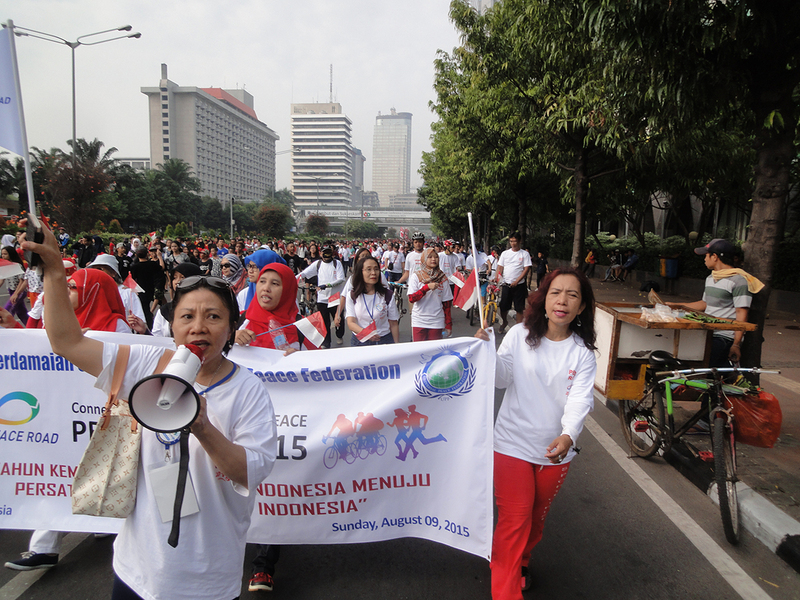 Thousands of members of Pencak Silat, the traditional Indonesian martial arts, had gathered from all over Jawa to walk the same route at the same time as we started our march. When we started to sing patriotic songs, they joined in joyfully walking side by side. The highlight was reaching the historical landmark of Jakarta-The Hotel Indonesia Roundabout with its prestigious buildings and monument. When it was time to turn back, we walked leisurely sharing our thoughts and hearts with each other. 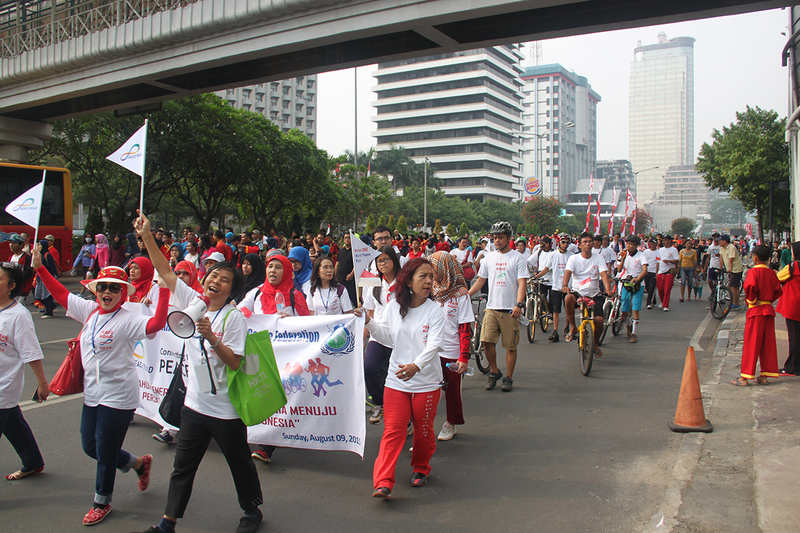 Ambassador for Peace, Mrs. Betty Sitorus, remarked though being a Jakartan, she had never walked this route on a car-free day before and was amazed at the throngs of people walking and cycling along this road this Sunday morning. 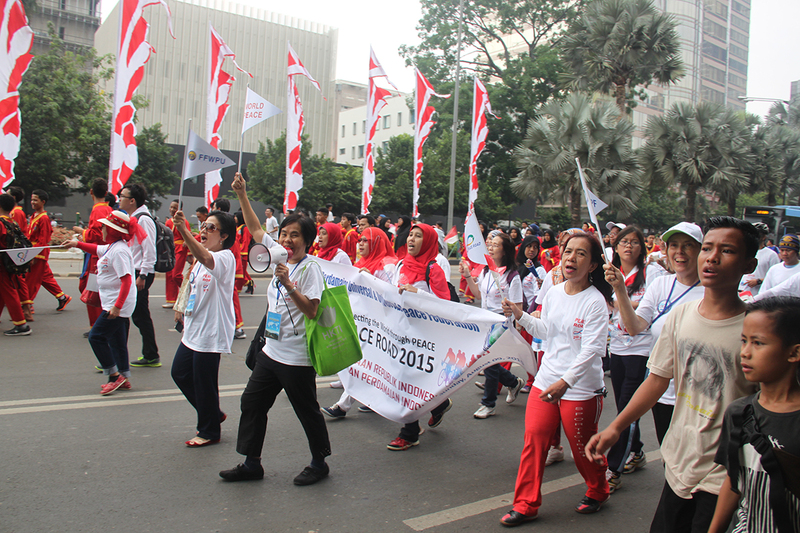 Everyone took note not only of our bright banners and colors but also of the bright spirit of our participants. It was time to celebrate the joy of bringing peace and unity to this conflicted world. Thank you, True Parents, for inspiring us with the vision of building One Family Under God. 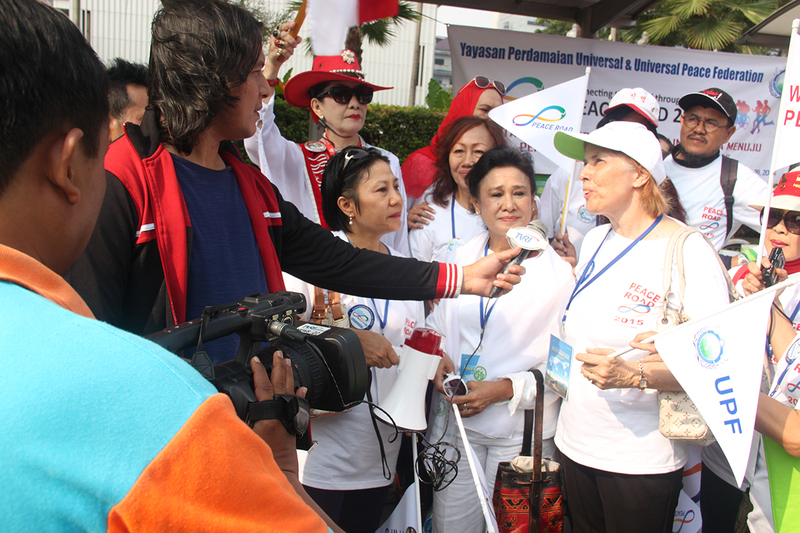 Our Peace Road march was broadcast on TVRI, a national TV channel, with interviews by the chair and vice-chair of the organizing committee, Mrs. Herawaty Rinto Paeran and Mrs. Meyke Rangkang.